Grand Rapids medical centers are known for quality medical care and patient safety, but even the most well-trained medical professionals can commit acts of negligence. In some cases, these mistakes go unnoticed, while in others, they result in adverse effects for patients. For unborn babies and newborns, whose brains and tissues are still in the early stages of development, such errors can lead to serious developmental delays and lasting health issues. If your child suffered a birth injury (that is, harm from a medical error during or near the time of birth), you may be eligible for compensation. Financial recovery from a birth injury lawsuit can provide your child with the means to afford lifelong treatment, therapy, and other necessary resources. Pursuing legal action can also help you obtain justice, and ensure that the same mistakes do not happen again. 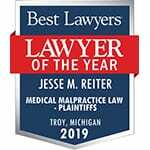 Please contact ABC Law Centers for more information; our office is based in Bloomfield Hills, Michigan, but we can travel to Grand Rapids and surrounding areas. For that matter, we serve clients throughout the country. ABC Law Centers is one of the few law firms in the U.S. that focuses only on birth injury. This allows us to focus 100% on the details of these complex medical cases. Unlike other personal injury firms, which may split their focus to handle car accidents, drug interactions, and medical device malfunctions, as well as birth injury, ABC Law Centers focuses exclusively on birth injury. Our firm consults with leading medical experts, care planning professionals, and other specialists to help determine what kind of care your child will need throughout their life. Partners Jesse Reiter, Rebecca Walsh, and Euel Kinsey are all currently recognized as among the “Best Lawyers in America” by the U.S. News & World Report. Call us today at 866-746-1520 or Live Chat with us 24/7 using the chat button in your browser. We would be happy to provide you with a free case evaluation and talk to you about your options for pursuing a case. Birth injuries can impact a child’s physical, emotional, and mental health. These injuries can lead to developmental delays, intellectual and learning disabilities, or cerebral palsy. The extent to which a birth injury can impact a child’s functional ability can vary vastly; some children with birth injuries do not have any functional impairments or very mild ones, while for some children, the outcomes can be very severe and require around-the-clock medical care and therapy. The amount of damage related to a birth injury depends on multiple factors, including how long a child was deprived of oxygen and whether blood flow to the child’s brain was completely stopped or partially stopped. It can be difficult to evaluate the extent of a child’s injuries immediately, as some developmental delays aren’t detectable until the child is age two or older. In some cases, when the child reaches school age and begins to struggle with their lessons, the delays can be more evident. However, it is important to speak to an attorney as soon as you suspect a birth injury, because different states have different time limits (called statutes of limitations) for when a lawsuit can be filed. Traumatic birth: If a labor and delivery is traumatic (due to prolonged/stalled labor, the use of vacuum extractors and/or forceps, or the overuse of delivery drugs like Pitocin or Cytotec, for example), the baby is more likely to be harmed. In some cases, it can be necessary to initiate a C-section in order to prevent injury. Fetal distress: During labor and delivery, if a baby’s heart rate drops significantly and doesn’t recover, it is very likely the baby is experiencing fetal distress which can be a reaction to oxygen deprivation. If oxygen deprivation goes on long enough, the baby may develop an oxygen-deprivation induced injury called hypoxic-ischemic encephalopathy (HIE), which must be treated within six hours of birth using hypothermia therapy. Fetal distress can also trigger the baby to have a bowel movement in the amniotic sac. Because the baby breathes in amniotic fluid, it can be at risk for inhaling stool (meconium aspiration syndrome), which is an infection hazard and can interfere with proper breathing. If a baby is having fetal distress, it is an obstetrical emergency and the baby should be delivered quickly via C-section to prevent further damage. Brain bleeds: Newborn babies’ brains can be very fragile, especially if they are small, premature, or are subjected to a traumatic birth. Brain bleeds can often cause (or be the cause of) neonatal brain damage, so it is important that medical staff follow standards of care to prevent brain bleeds from occurring. If they do occur, brain imaging can be recommended to assess what kind of therapy and treatment a child may need to minimize permanent effects. Cerebral palsy: This motor disorder can show up as an early preference for one side of the body over another, or via excessive muscle tightness or limpness. Cerebral palsy can sometimes be traced back to an underlying injury to the motor centers, which interfere with proper signaling to the muscles. This can often be traced back to HIE. Low blood sugar: It is absolutely critical that a baby’s rapidly-developing brain have an uninterrupted supply of blood sugar that is neither too low or too high. Some babies (especially those that are very large or very small for their gestational age) are prone to developing low blood sugar and can require additional monitoring and feeding. If blood sugar is too low for too long, brain cells become deprived of their only energy source and start to die off. If a baby is in the NICU, medical staff should watch these babies and ensure they are receiving proper nutrition. High-risk pregnancy: Mothers with certain diagnosed health conditions are ‘high-risk,’ meaning that it is more likely they will have complications or other health issues during pregnancy. Women with diabetes, preeclampsia, obesity, hypertension, and other conditions should be referred to a maternal-fetal specialist who can conduct more frequent monitoring to ensure the pregnancy goes smoothly. One of the most common trends we see in birth injury litigation is high-risk patients not being monitored or treated as high-risk patients. It is important that women with high-risk pregnancies be informed by their physician of their status so they can get proper maternal-fetal care. Infection: If the mother has an infection such as group B strep or a UTI that goes undiagnosed, this could be passed to the baby during a vaginal birth or when her membranes rupture (commonly referred to as the “water breaking”). Depending on the type of infection, it may be safer to deliver via C-section before the membranes break. For certain infections, mothers can be placed on antibiotics or antiviral medication prior to labor and delivery to suppress the infection and prevent passage to the baby. If a baby is suspected of having an infection after birth (such as meningitis or pneumonia), treatment should be initiated quickly to prevent tissue inflammation and other complications, as these can result in seizures or developmental delays as the child grows. Jaundice and kernicterus: When a baby is born, they can sometimes develop jaundice (yellowish skin and eyes). In some cases, this can resolve on its own, but there are certain cases where the baby may need help with the underlying cause of the jaundice, in which case they are placed under a special set of lights or under a fiber-optic blanket to help them break down excess amounts of bilirubin. If jaundice goes untreated or is treated improperly, however, excess bilirubin can cross the blood-brain barrier and cause permanent and irreversible brain damage. This is often medical negligence, as kernicterus is the result of a condition that was not caught in time or properly treated. Placental abruption or uterine rupture: These two conditions relate to maternal bleeding. Placental abruption occurs when the placenta detaches from the uterus, while uterine rupture occurs when the uterus tears through its layers. Both have the potential to become very serious immediately, as both can cause massive bleeding in both the mother and the child. Bleeding can then result in blood pressure to the baby dropping, which can cause hypoxic-ischemic encephalopathy and other oxygen deprivation-related injuries. Abnormal fetal presentation: It is often safer to deliver babies who have malpresentation via C-section because of the risk of traumatic birth, which can increase the risk that a baby will have brain bleeds and/or swelling of the face or upper airways, which can prevent proper breathing. Umbilical cord problems: The umbilical cord is the baby’s only method of exchanging oxygen, nutrients, and waste products. Umbilical cord issues of any type can compromise the flow of oxygen and nutrients to the baby and lead to HIE, cerebral palsy, and a variety of other complications. Umbilical cord issues can often be diagnosed via ultrasound testing, and should be addressed by maternal-fetal medicine specialists. Pursuing a birth injury lawsuit can be a big decision for a family because of the fear that it will take away valuable time spent caring for their child. This is why it is important to carefully consider options in choosing an attorney. Parents should choose an attorney that will clearly communicate expectations and updates about their individual case, and that makes clear at the outset what working with the firm will be like. The Grand Rapids birth injury attorneys at ABC Law Centers have a track record of multi-million dollar verdicts and exceptional client satisfaction. Contact us for a free case evaluation. In fact, you pay nothing throughout the entire legal process unless we win your case.